Awaiting us when we got home from Ireland the other week was a very welcome box of salted caramel truffles from a dear friend. She must have known how tired we’d be from a six hour drive in the early hours of the morning; we were definitely in need of a pick-me-up. These Salt Caramel Truffles were from a company I’d not heard of before, Terre à Terre, but it was one my friend had been impressed with and thought I should know about. As it turns out, it’s a vegetarian café in Brighton which, in its own words, “is more about indulgence than abstinence”. I was very glad to hear this as there doesn’t seem much point in going out to a good café if you are going to abstain. Catering for vegans and various allergy sufferers as well as vegetarians, the menus sound very tempting and if ever I am in Brighton I will be making a call. If you are not lucky enough to live close by, you can purchase these truffles from Terre a Terre’s online shop along with a number of other treats – chocolate and otherwise. A 130g box containing twelve good sized truffles costs £8.20. So what were they like? Sturdy rich dark chocolate shells rolled in cocoa powder, but with plenty of room for the generous amount of salted caramel contained within. They had perfect liquid centres which weren’t too runny; they weren’t too salty either. All in all a beautiful combination. CT was very lucky to get a look in, even though they were meant for both of us. When I first came across The Grown Up Chocolate Company on Twitter @grownupchocs, I was intrigued. This innovative British company specialises in “childhood chocolate classics with a grown-up twist”. Well I’m not sure about the grown up twist, but they have achieved the indulgence and decadence the company aspires to. These bars are pure fun and the company delights in being rather silly – quite childlike in fact. I heartily approve. These 65g cardboard covered packs of unsophisticated delight contain two bars. Perfect for sharing, but not with the little monsters, apparently. I was sent two packs to try. I may not have revelled in the taste of both of them, but I certainly enjoyed the experience. These chocolate bars are well worth looking out for. You can buy them online for £2.50 a pack as well as at Ocado, Booths, Fortnum and Maison and various other independent retailers, both in the UK and abroad. Glorious Coconut Hocus Pocus – a mixture of coconut, nuts, fruit and white chocolate, covered in milk chocolate, this bar was gloriously chewy and really very tasty. Even though I could taste almonds, apricots and citrus peel through the coconut, this bar made me think Bounty Marathon hybrid. White Chocolate Praline Wonder Bar – another bar which had plenty of texture, but was too sweet for me. I found it hard to get to the flavours through the sugar, which was a shame as it sounded rather good with its caramelised wafer praline, fudge and biscuits. Another British chocolate company, but a much older one is Beech’s Fine Chocolates. Established in 1920 it specialises in classic British chocolates. I really enjoyed their chocolate bars which I reviewed a while ago. This time around I’ve been sent After Dinner mints to try out. The mint used is English Mitcham Mint oil and is grown in the very English county of Hampshire. Special Offer – Beech’s have offered Chocolate Log Blog readers a 10% discount code for their online store if you’d like to indulge in any of their products or buy presents for those that appreciate traditional English chocolate. Please use code BFC04061410. Mint Crisps – thin dark chocolate (55%) wafers containing crispy mint pieces which give a knobbly effect are perfect after dinner fare. I’ve found they are also rather good before dinner! They are refreshing with a good crunchy texture and just the right size to help yourself to a second piece without feeling too guilty. Mint Creams – I’m a bit of a sucker for mint creams, even though they are really rather sweet. These are no exception to the sweetness rule which is why the dark chocolate (55%) coating is particularly welcome – it takes the edge off the sugar just a little. The mint has a good flavour and the creams have a smooth texture. I found that one was plenty. So much to taste in Chocolate Week. Thanks to my lovely friend A, The Grown Up Chocolate Company and Beech’s for the chocolates. I was not required to write a positive review and as always, all opinions are my own. Oh my goodness, a post dedicated to chocolate. I am totally in heaven with this one. Very partial to anything minty or caramel, so you have two of my faves in this list! You’d have thought the blog name would be a hint. I don’t know where to start here, the salt caramel truffles have my eye straight away but hocus pocus sounds intriguing too! Sarah, I’m a complete sucker for salted caramel, so that would always be the first thing to draw me in. My mouth is watering just looking at this post I shouldn’t have read this before dinner haha! 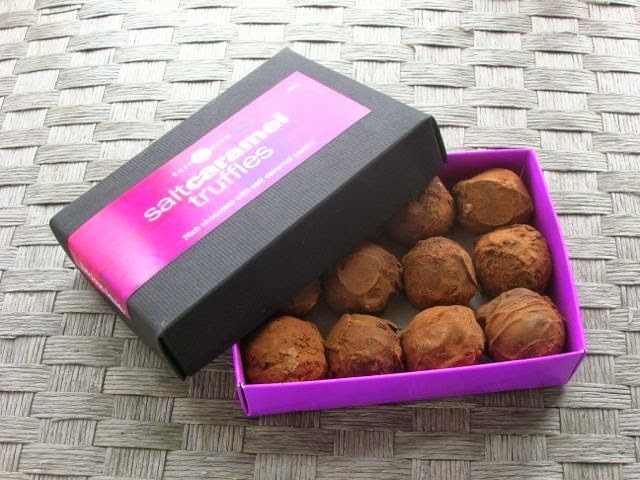 Salt caramel truffles sounds yum! The salt caramel truffles are indeed yum and they didn’t last nearly as long as they should have done Sarah. Good to know Rachel, thank you. I guess I should plan a trip to Brighton one day, I haven’t been there since I was a young child. Will look out for their book. Ooh yes, Bendicks – mmm. I am such a sucker for mint chocolate! But the salted caramel truffles sound good too. Salted caramel first and foremost for me Alicia, but I can’t say no to a mint chocolate either. You would not believe but I have never ever tried salted caramel truffles. Bintu, you are right, I’m finding that very hard to believe. I think it needs to be sorted. I’m well jealous! Getting to test chocolates every day in the interests of chocolate week…… My idea of complete heaven! I’m for the salted caramels and mint creams! If you have any left, send them my way! !